Start from the beginning here, or check out the links at the bottom for posts you might have missed. 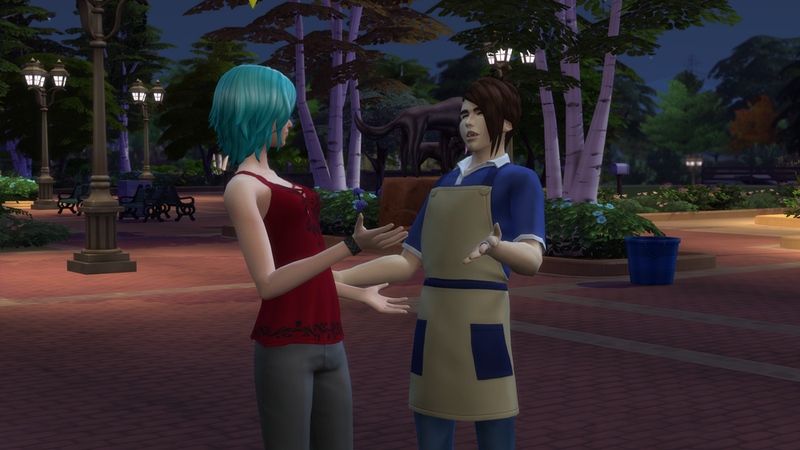 When we last left off, Yuki and Hugo were on a date...Well, they were hanging out at a restaurant. Definitely not a date, since she is currently a Young Adult and he's a Teen. It's very awkward when a close friend transitions before you. Aww...it's the whole Goth family out to dinner. That's wonderful to see! I think Cassandra would make a good friend for Yuki. Look at just how *happy* this Loner is in a restaurant when he is with Yuki. Spooky Day is almost upon us! Jacques loves holidays- particularly Spooky Day. He spends a couple of days...yes, days...carving pumpkins to decorate the yard with. Luna might be a popular, fashion-focused teenager with her eyes locked on getting a boyfriend, but when she's alone, her child-like nature shines through. She has an active imagination and dreams of princesses, rainbows and llamacorns. The house is all decorated for Spooky Day! Max is an evil mad scientist in the making! The little rebel enjoy using his intelligence to make materials of destruction with his chemistry set. We most make all of the pumpkins! Jacques aspires to become a master pumpkin carver! I think his skills are improving. What do you think? Even the lopsided one is pretty cute though. The butler was missing for hours and hours. Jacques finally found her on the far reaches of the property. Perhaps she got lost? Or was she trying to escape Jacques madness? Who is your favorite member of the Villareal family? Comment below! Comments are one of my favorite things. It's time to meet our third and final household for Round 2! Joining us will be Hugo's family- the Villareal household which consists of Jacques, Hugo, Luna and Max. This family was selected primarily because of Hugo's connection with Yuki (good friends and a mutual club). Jacques is Hugo's eccentric father. Jacques is now raising the three children on his own after his wife disappeared (under mysterious circumstances.) Jacques is a bit odd and can be a bit careless, but there's no doubt he does care for his children. Max is Jacques youngest child. Max is a bit of a terror. He's a very dark young man with some peculiar interests such as taunting other children, working late hours on his chemistry set, and destroying things other people have created. Jacques third child is Luna, the middle child and the only female in the house. Luna makes new friends easily. She can be playful and naive, but she means well. She's a bit on the vain side, but what teenager isn't? She's pretty and popular. Being an eccentric genius, Jacques has always been a difficult man to get along with. However, time hasn't been a friend to Jacques and it's made him a bit of a misanthrope. He uses his wit to shape biting insults and relishes in the reactions he gets from people. While not truly evil, he could easily be compared to a playground bully. Taunting, mean-spirited pranks, and petty name-calling are just some of his devious tools. While kind to his children, everyone else is fair game for his cruelty. Hugo chooses to spend his time in more positive creative pursuits. 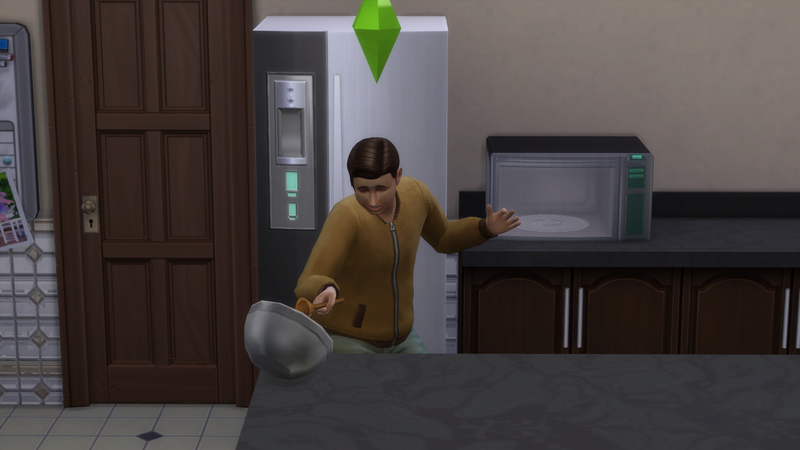 Hugo aspires to be a gourmet chef and he is already well on that path. He does all of the cooking for the family making them a wide variety of delicious and nutrition-packed meals. Jacques is retired, and definitely has too much time on his hands. In the middle of the night, he can be found roaming the mansion in his favorite bathing suit, warming himself by the fire...as one does. The city of Windenburg has a small island, simply referred to as "The Island". Three households live on The Island- Villareal, Bjergsen and a house with two roommates- Joaquin (Candy's friend) and Sergio (we'll meet him soon). Bjorn and Clara Bjergsen stopped by to check on the older gentlemen during the day. Jacques welcomed them joyfully. He was happy to have the company as the kids were in school. However, he then proceeded to offend them both by making highly flirtatious and inappropriate passes on each. They left quickly and did not return. There is a single, tiny room in the basement of the Villareal's mansion. This room is where Hugo goes to practice his dance moves. His creative talents are firmly in the areas of the culinary, not in dancing, so it is best to do this in a room with no windows. Do you think the Villareal household are a good addition to our rotational play? Which of member of the Villareal house are you most interested in hearing more about? Summer and Candy were out for a night on the town at the Stargazer Lounge! 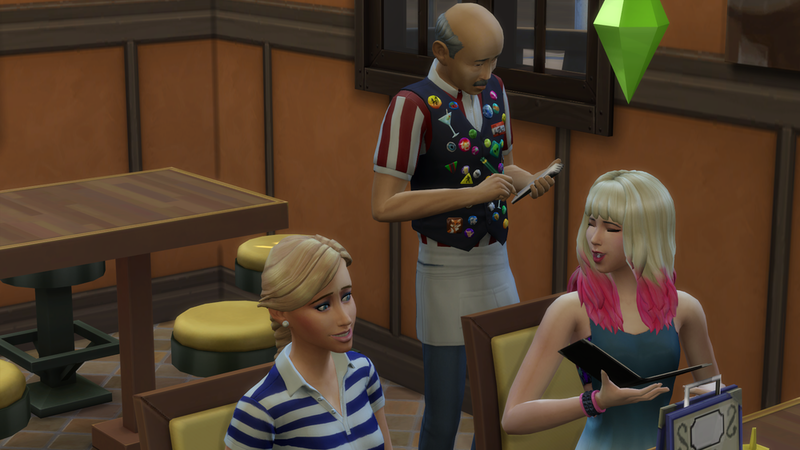 While they were looking to meet some new faces, Candy had one eye on Akira, the cute bartender. The talked for a bit, but she didn't think he was interested. Other guys tried to make an impression on Candy, but it didn't go well for any of them. This guy was pretty cute, but he was a bit too vain for Candy. Summer didn't find anyone particularly interesting either. The next morning, Yuki was so excited to watch the season premiere of a new show that was airing that night! True, most people were excited to see Game of Llamas, but Yuki was totally nerding out about it. Don Lothario invited Candy out on a date that evening...but he chose to visit the ruins, a completely outdoor venue, when it was supposed to thunderstorm! The date was pretty miserable. Candy left early, which Don wasn't upset about. She probably won't be going out with him again. Not a great week for romance! Late that evening, Caleb threatened to upset the peace between the sisters. Yuki got a phone call after she was already tucked in bed for the evening, asking her to come to Forgotten Hollow to see Caleb, and to meet his sister. Curious to see Caleb at home, she went. Caleb's sister was lovely, and it was good to see Caleb not wearing an apron. Apparently, he is quite the fancy dresser. Much to Candy's surprise, Akira called her the following day. He asked her to go out to breakfast with him. She loved the idea. Things went well. Very well. Maybe this wasn't such a bad week for romance, afterall? On Saturday, it was Yuki's birthday! Candy threw a wonderful party with all of their friends. And before we all knew it, Yuki was a young adult and Candy was no longer the parent of a teenager. While many friends attended including her good friend Hugo, Yuki was most excited to have Caleb over. After most guests had left, they stayed in her room talking until quite late. When it was time to say goodbye, he gave her a hug. This hug felt...different...than the previous hugs, Yuki thought. Maybe? It was probably just her imagination. We are now back with Yuki and Candy, and things have taken an interesting turn. Yuki is going through a bit of a phase. She isn't interested in hanging out with Candy anymore. Candy is acting like too much of a mom, and Yuki just wants to be left along to do her own thing. To help relieve some of these feelings, we got Yuki a journal which she's now writing in on a regular basis. Journals are great for emotional control. Candy knows that Yuki is a responsible and dependable kid, so she isn't too worried about this new phase. After they have a bit of an argument, Candy just heads up to her room to relax and completely immerse herself in some music. Jesminder invited Candy and Summer to the flea market. Candy had Yuki tag along. Candy thought getting in some sunshine and some social activity would be good for Yuki, who would have preferred to stay home on her computer. Yuki was so grumpy the whole time at the market! Well, look who it is? Good old Jonas! He loves just showing up and crashing the gatherings. He's nice, though, so we let him. In the back, you can see that Summer ate some spicy food, and Yuki is so not impressed with this. Despite everyone's attempts to engage her, Yuki was very tense. It was hot out, she was with her sister and her friends. It was too crowded. Groups of people stress her out. She decided to take a jog around the outside of the flea market to clear her mind. That's when she ran into Caleb. Caleb had just ended his shift working in the area. He asked if she was okay, and then listened patiently while she vented. Yuki just needed someone to listen and understand, which Caleb did, so she was immediately smitten with him. They chatted on that street corner for hours, well into the evening. They exchanged contact information and promised to keep in touch. Candy purchased a lamp for Yuki's room while she was at the market. The lamp matched perfectly with Yuki's nightstand. Yuki loved it. The next night, Yuki had already gone to bed when she got a phone call from Caleb asking her to meet him in the park. She broke curfew and met him. Cassandra was also there and they chatted for awhile. Caleb and Yuki stayed in the park until early the next morning. Liberty has one of the toughest career paths in all of SimNation. She's on track to one day become an astronaut, but there will be a lot of hard work along the way. She has started playing chess to improve her strategic thinking skills. Clearly, in this shot she was distracted by something, but I have no idea what! 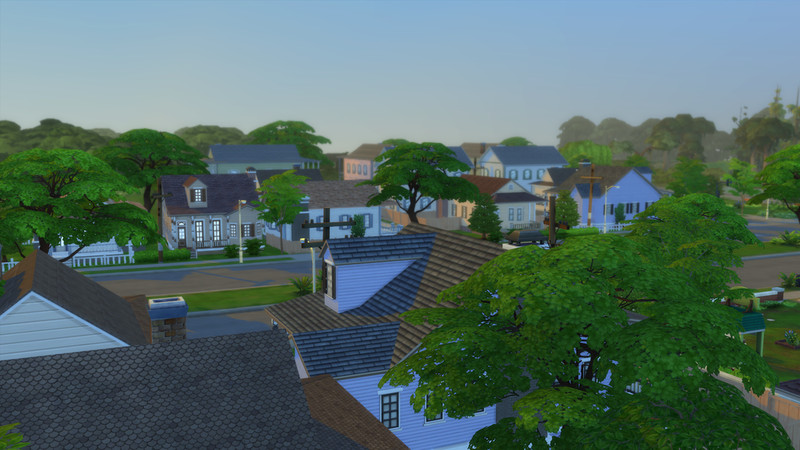 Willow Creek is such nice, normal bit of suburbia. Quiet and lovely in the morning. Karim has pretty much become Travis' only friend, other than his roommates. He is a good friend, however, stopping by quite frequently to chat about all sorts of things and have drinks at the roommates' bar. Look at his eyes! He knew what I was doing! LOL. Yes, Travis, you've been developing a bit of a gut! Must be all that time spent on the computer. It's okay, though, plenty of ladies like a man who is a bit soft! It's SUMMERFEST. This is Summer's FAVORITE holiday. As you can see in the left top corner, there are three traditions she LOVES. Inviting people over, playing in the water, and having that party spirit! Summerfest is a time for friends, outdoor fun and laughs. Liberty even tried to be social. She sat away from the crowd, of course, but she still managed to having a good time chatting with Zoe and Karim (she still has no clue that he was the annoying bear). Summer made sure there was plenty of water fun! Water balloons, a kiddie pool, a sprinkler! The sprinkler broke halfway through the festivities- fortunately, Liberty was there to fix it! After everyone had gone, Liberty and Travis continued to play in the sprinkler for awhile until they were exhausted, and then they both turned in. Summer was still feeling the party spirit, and didn't want to go to bed. She headed outside to see if any of the neighbors were around and up for a bit more fun. While she was out there, she ran into Justin. Remember him from the park? The guy she was really crushing on, but rejected her advances? Well...he did not reject them this time. In fact, he was a little too interested. And before any of us (Summer, Justin, or myself) realized what was happening...yeah, she took him back to her room. Hopefully, one doesn't regret what she's done during the giddiness that is Summerfest! Liberty's collection of...nature...makes for interesting viewing while chatting on the phone with one's best friend. 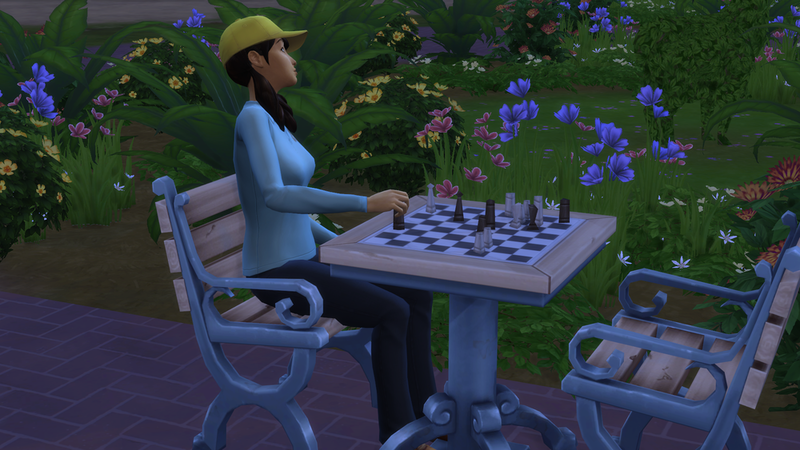 Speaking of the bestie...Summer & Candy decided to continue their conversation at the park while looking for cute guys, as both of them are currently single. The park has a bar, so Summer poured them some drinks. Candy didn't feel like Franks n' Beans so she volunteered to cook dinner. Candy doesn't really know how to cook anything more than a grilled cheese sandwich....but she managed some hot dogs. After awhile, a guy named Justin stopped by their table. He wasn't Candy's type, but that's okay because Summer was digging the professional look. Summer and Justin hit it off really well. She was flirting, he was flirting back and things were good. So, feeling a bit more confident, she decided to take a more direct approach in their conversation and it did not go well. She headed home from the park feeling quite rejected and embarassed. Liberty has been showing quite the talent for being handy. Travis' stereo broke and he couldn't listen to his talk radio while working on the computer. Fortunately, Liberty was able to fix it quickly. Summer met this friendly stranger at the park one day. He offered to play chess with her, but they mostly just chatted. He was a bit odd, but nice. Apparently, Travis needs to be social even when doing things that should be kept more private. I wonder if the person on the other end knew? Summer and Liberty discussing....children? over a late night dinner. 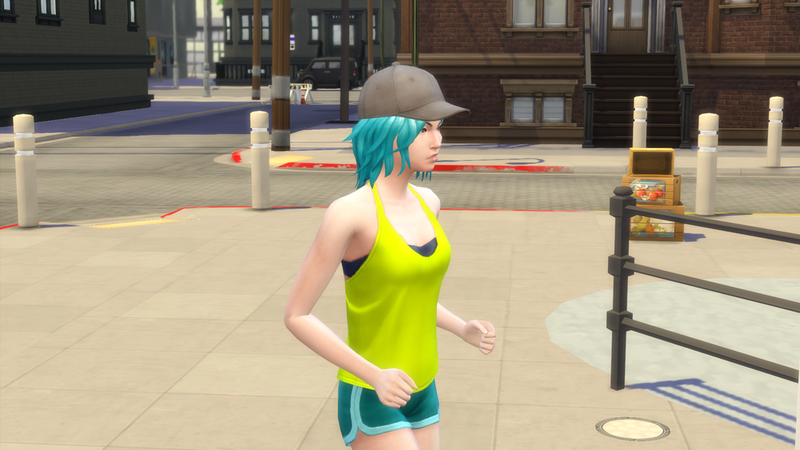 When she doesn't have time in her schedule to go to the gym, Summer likes to take a run before work. She's been thinking maybe she needs some sort of fitness routine. Summer knows Dina & Nina Caliente from the club and the gym. This morning while she was outside, she ran into Katrina, their mother, walking through the neighborhood. Lunch on the deck! Summer enjoys the sunshine, and she's looking forward to this thing called "weather" and "seasons" that, rumor has it, is arriving soon. Summer decided to hit the gym, but first she called Dina to see if she could join her. Dina was on her mind after running into Katrina! As it turns out, Dina was already at the gym! Dina was already done with her workout, though. Before Summer began her workout, they hung out together, watching the clouds and chatting. Summer tried the rock wall for the first time! It was hard work, but she already started getting the hang of it before she left. When Summer got home, she tried a new recipe for dinner- Italian Meatballs! It's Round 2 and we are back visiting Summer, Liberty and Travis. Summer is continuing to be the cook of the household, and Liberty has become the unofficial fix-it girl- saving them a lot of money in repairman charges! There was one morning when I caught them all hanging out in the bathroom together. Sometimes you just HAVE to tell your roommate something. Travis kicked the other two out, eventually, as he actually had to use the restroom for its intended function. Travis still hasn't clued Liberty in on the fact that his new friend he met while camping is, in fact, the bear guy that Liberty so hated. They went out to the coffee shop to try to meet some "chicks". It did not go as planned. 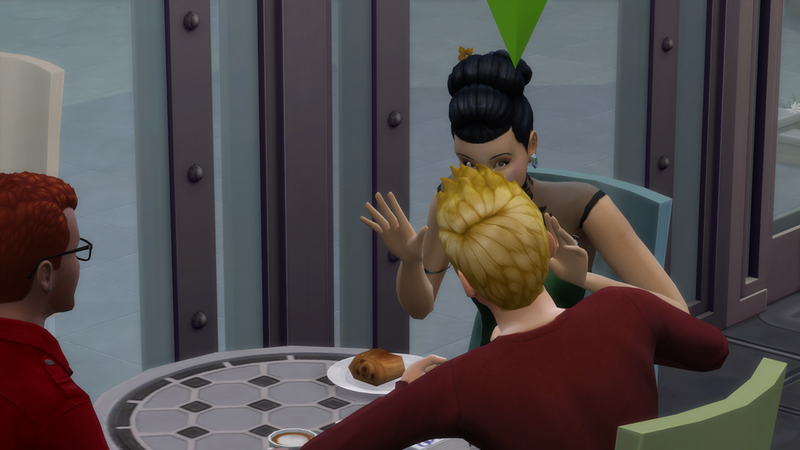 This elegant lady, who was a bit older than them, entertained their conversation and politer flirtations, but when Travis' confidence led him to make an actual move...he was rejected soundly, and left feel quite embarassed. Liberty & Travis eat breakfast together in the morning on most days since they start work close to the same time. If Summer gets up early enough, Liberty will join her at the table for breakfast to keep her company while she eats. Liberty has been working diligently to organize and identify all the things she cataloged while camping. This included several mysterious mushrooms. On Liberty's days off, she spends time in the garden enjoying her treasured collections, and reading in her room (of course). When Travis got home from work, he was quite ravenous, so he grabbed a burger from the fridge (Summer leaves leftovers in the fridge all the time) and joined Liberty in her room. Summer wasn't home yet and he needed company. Summer is now working as a caterer. She doesn't get home until 11pm on workdays. However, she always cooks a full fledged meal when she gets home. Liberty and Travis haven taken to having dinner when she does. Sure, they could have the leftovers, but the freshly made meal is even better! The Notes posts will come at the end of each of the rounds. They will contain gameplay information that I wanted to share that is not part of the story itself. They are also a place for me to share answer's to questions I receive from readers during the round. So please, ask me questions! So glad you asked! This story is a rotational game, which means I am going to be rotating between different households within the same save. Because they are within the same save, the households I am playing can interact with one another. Each Round will be complete when I have played one week of each of the households that are currently in play. In Round 1 we had two households. In Round 2, we will have three households. I'm going to continue adding households until I feel I have just enough. I'm thinking we'll end up around five. How I Select Families- The Twist! This is the interesting part of the challenge! The households that get played each round will be DIFFERENT. We will probably end up with mostly the same ones each time. However, as the story progresses things might shift. The first household was different. 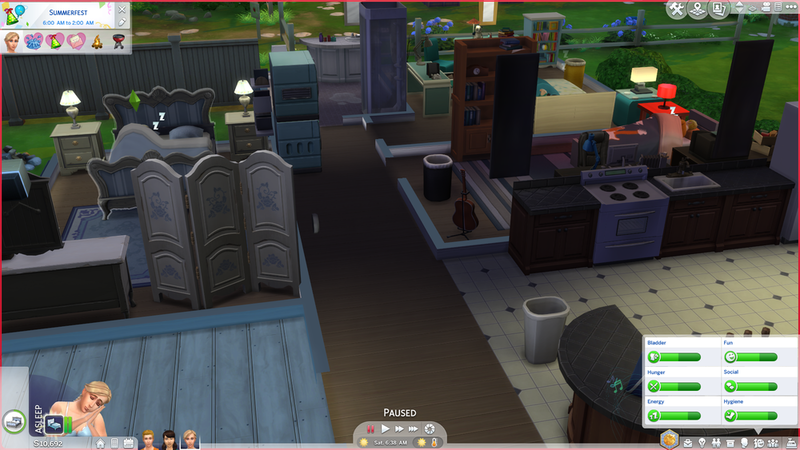 I wanted to select one premade household from Willow Creek (the first neighborhood of the game). I wanted a household that would give me the greatest chance of multiple storylines, so I went with a household that was three single young adults. After selecting them, I played them for a week. Once the first week was done, I took a look at the external relationships of the household. What were the most significant relationships (either positive or negative)? In this case, the one that stood out the most was Summer's friend, Candy. Candy's household became our second one. After I played Candy's house for a week, Round 1 was complete. I'm not preplanning these storylines. I'm letting them play out and seeing where they go. I will help them along, but I take my cues from the Sims themselves. Liberty's crush on Summer developed because on Day One, Liberty got the whim to "Flirt with Summer". 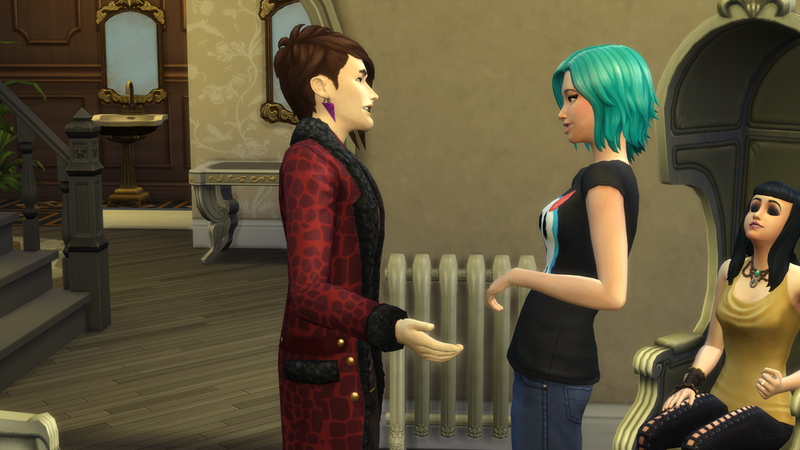 I decided since that was the only desire for flirting that happened within the first few days (at least) and that it was Liberty's first whim for either of her roommates, that Liberty must have a crush on Summer. I then helped that crush along a bit throughout the story. Setting the Stage for Round 2- Another Twist! The Round 2 households were selected in the manner in which I intend to use in the future. I took a look at all the significant relationships from all of Round 1 and selected the households with the highest number of significant relationships to all the Round 1 households. So, anyone who had a relationship with: Summer, Liberty, Travis, Candy or Yuki. In addition, I have a table of (currently) 70 different events that could happen each round. I will randomly select one each round (online die roll). Events vary drastically in severity. Here are some examples: Someone gets a divorce, someone adopts a dog, everyone goes out to eat, everyone's yards get an upgrade, a bakery opens in town, someone quits their job, etc... This serves to a) keep things interesting!, b) encourages me to explore DLC...many of the events are based on DLC packs, and c) keeps things more real by adding unexpected life events like divorce, babies, money problems and deaths. And I will leave that as our conclusion to the Round 1 Notes! 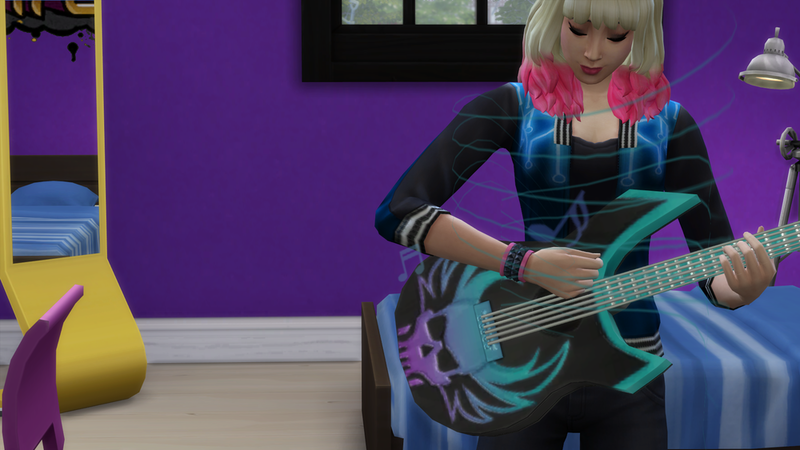 Candy continued to make progress on teaching herself to play the guitar. She hopes to one day be able to play in front of an audience. But for now, Yuki enjoys listening to her practice (while checking text messages on her phone, of course). 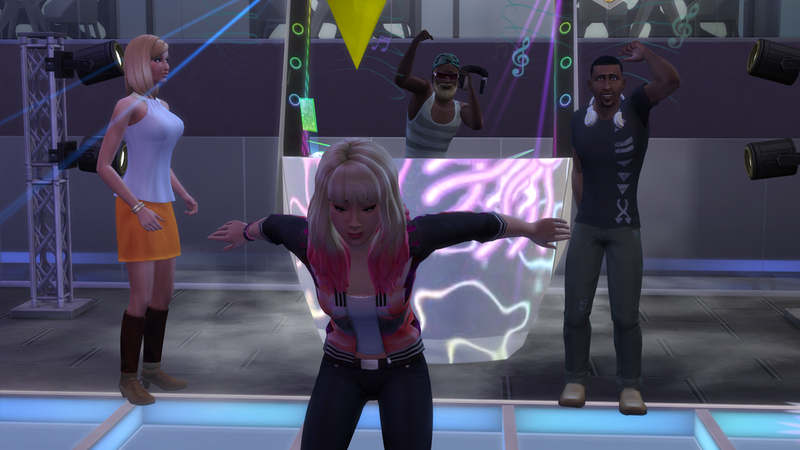 Sometimes, Candy fills in as a DJ at the club. She's pretty talented in all areas of music, and she's been practicing her DJing skills for quite some time. It's a fun way to earn an extra bit of cash. Joaquin is a fine substitute for Candy on the dance floor. He gets the crowds moving when Candy is running the booth. Yuki doesn't enjoy real world sports, but virtual ones are a great way to let off some steam after an evening dealing with customers! Of course, gaming on the PC works just as well. Recently, Yuki has begun to test her gaming skills in online competitios. Franks n' beans, Candy? Hmm...sounds like someone has been spending a lot of time with Summer Holiday! And here we are...Candy and Summer chilling at a restaurant before Candy has to head to work. Candy and Summer are the best of friends. They talk about anything and everything. Their cheerful personalities keep each other in a good mood. Who would have guessed Summer would get Franks n' Beans? I think Candy got her drink because of the color, honestly. While Candy is making new friendships and strengthening existing ones, Yuki continues to have no friends that are not her lovely sibling. She's content to spend her days as alone as possible. Yuki had been struggling in school recently, so Candy found some time to help her with her homework. Candy has been trying to figure out how to be both a parent and a sister to Yuki. Another night off, another night at the club for Candy. There is no better dancer than Candy. Seriously. 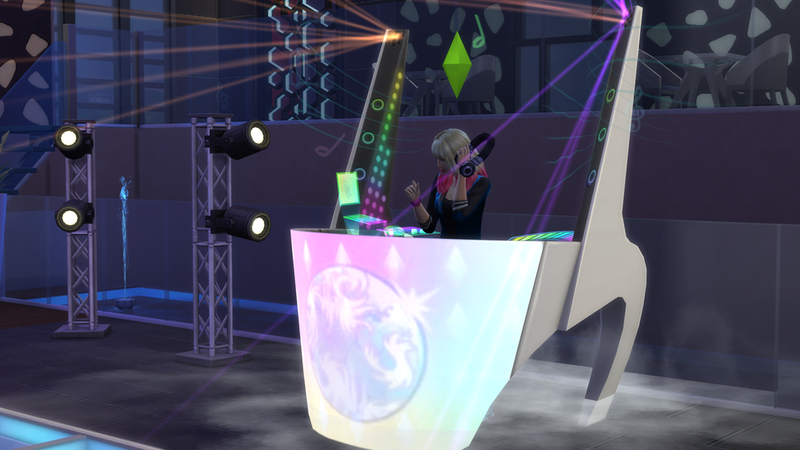 Ask any Sim at the club! People clear the dance floor and cheer. It's no wonder she likes hanging out there! 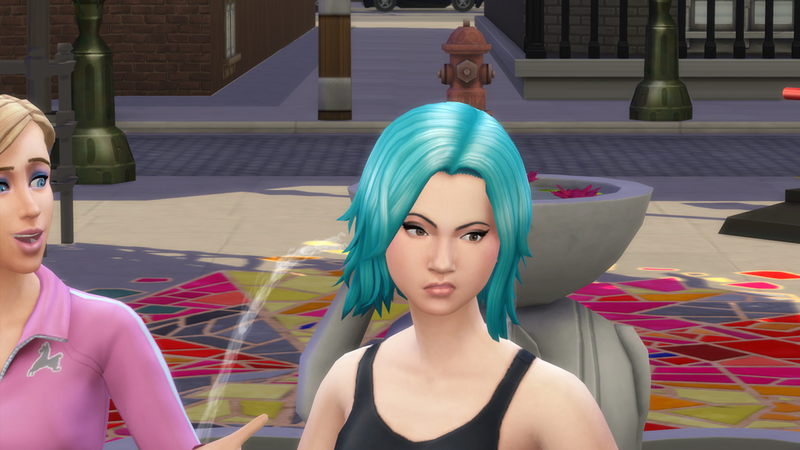 While both Candy and Summer love meeting new people, they've been spending a lot of time together at the club. They've become quite close friends. Yuki might not be the most social gal, but she is still a teenager. Every morning, she stares into the mirror wishing for a zit to go away, or wondering if her shirt is flattering. Neither Yuki or Candy know how to cook. The stove has only been used for Grilled Cheese. Most meals consist of cereal, pastries, peas, oatmeal and microwave chicken nuggets. 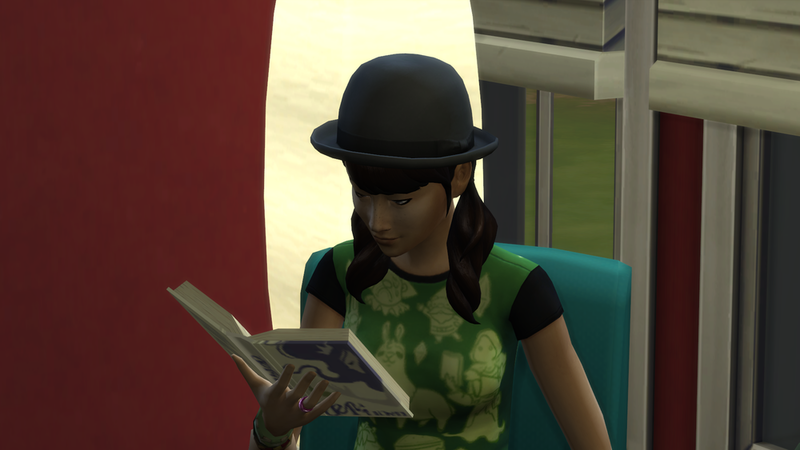 Yuki is interested in learning more about cooking, but doesn't know where to start (or have the time, really). Candy Behr is friends with Summer Holiday. Candy is a member of the Spin Masters and met Summer at a nightclub. They hit it off quickly thanks to their cheerful and outgoing personalities, as well as their love for dance! Candy is the older sister, and sole provider, of Yuki. 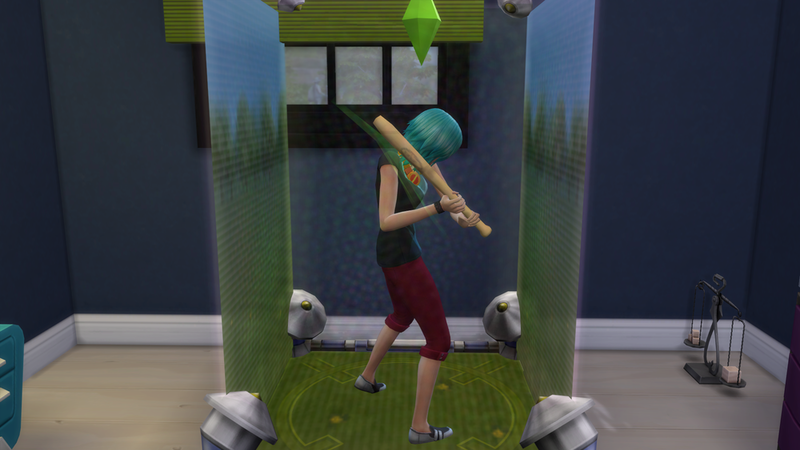 Yuki is an introverted teenager who loves video games. In fact, she tends to favor games and online interactions over real life social interactions. Her only friend is Candy. Candy works nights, and Yuki goes to school during the day. They have to take whatever opportunities they can to hang out. Yuki often does her homework at Candy's desk, while Candy practices the guitar. Despite being a bit of a loner, Yuki is in two clubs including the Avant Gardes who gather at a local coffee house. They have a meeting room in the back of the coffee house that's nice and quiet. Hugo is the only other teen in the Avant Gardes. Yuki likes Hugo- he's quiet and reserved like her. He also doesn't have many friends. The meeting room is a great place to read and drink coffee...and to not interact with the other club members? Yuki works part-time after school at HAMBURGERMAN! to help her sister pay the bills. Yuki doesn't mind it, though she knows she'd probably be able to do a better job in school if she didn't have to work. She's not going to admit that out loud to anyone, though. On Candy's nights off, she heads to the club to meet up with her friends (like Summer), and to show off her dance moves. Candy frequently leads the Spinmasters (Joaquin and Dominic) in some fancy group dance numbers. Their group dance routines usually attract quite an audience. 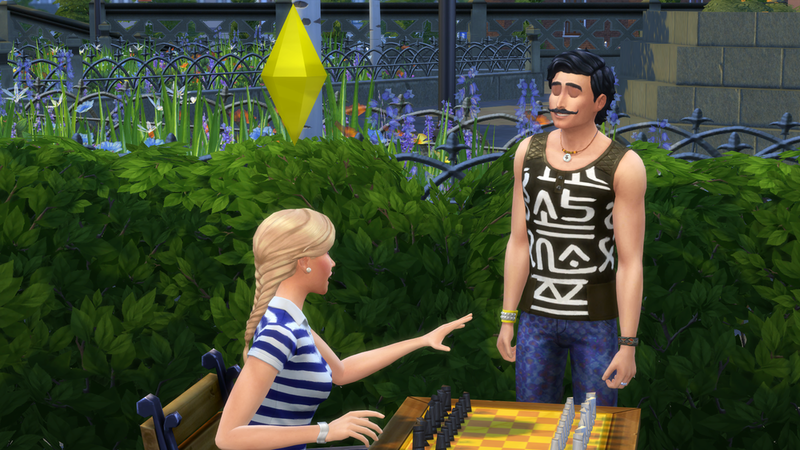 The roommates head back to Willow Creek to resume their work lives. Liberty was going back to being a Module Cleaner at SpaceY, Travis was doing Quality Assurance at Rainy Day Entertainment, and Summer was the Head Dishwasher at Make A Dish. While camping, Liberty decided she wanted to become more self-sufficient. When she returned, she was inspired to read some books on DIY projects and how to fix things around the home. This random guy showed up at the house looking for Travis. He said that he met Travis during their trip to Granite Falls. Liberty had no memory of this and was engaged in an awkward conversation with the guy when Travis started yelling from the bathroom. How convenient! Saved by...the toilet? Indeed. 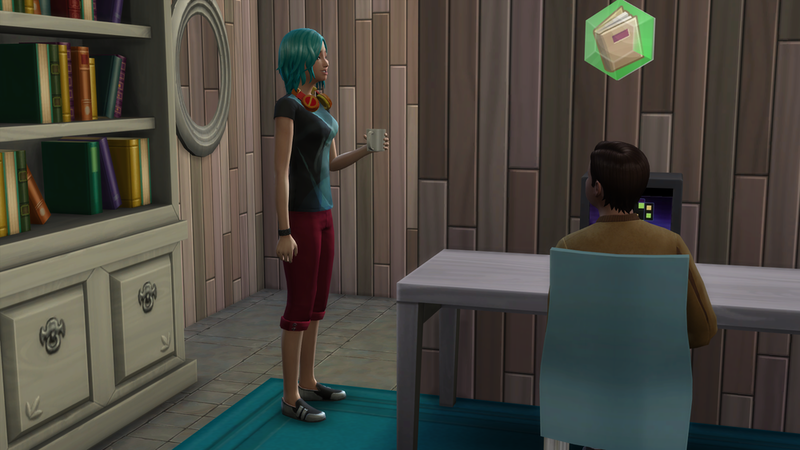 Liberty was able to trade the uncomfortable conversation with the random guy for a leaky toilet- that she coincidentally just read about how to fix! 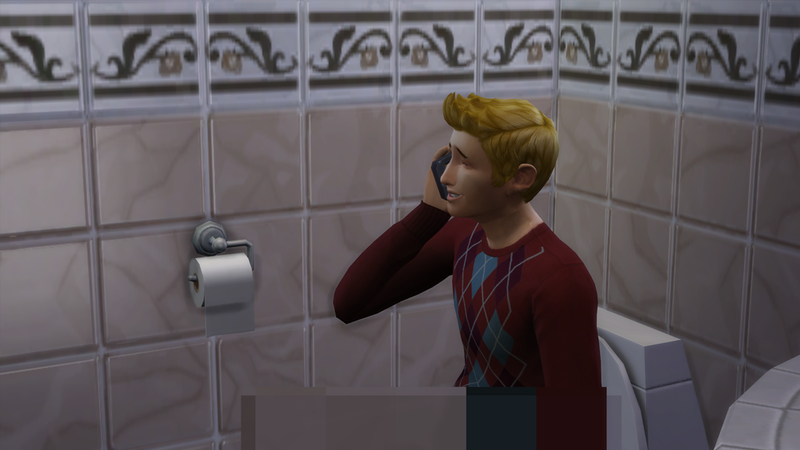 Travis was very confused about Liberty's reaction to the leaky toilet. He was annoyed by the toilet and concerned about it being fixed. Liberty, however, seemed excited? Still Travis happily traded with her. And enjoyed a wonderful conversation with is new friend that he met camping. Liberty had met him camping as well. Thankfully, she didn't recognize her arch nemesis without his bear costume on. That will conclude Round 1 of the Summer, Liberty and Travis household! Up next, you will meet Candy & Yuki for their Round 1. After that, you'll get a post with "Round 1 Notes", which will hopefully clear up any questions you might have. As always, I love feedback! Go back to part 1 here. We left off with Liberty telling off a creepy dude in a bear costume that was wandering around the park. The bear is just like "Alright, alright. Lady, I'm leaving. It just takes a minute to get up from the seat in this costume." As it turns out, camping was a wonderfully bonding experience for our house of roommates. They spent a lot of time around the campfire chatting about all sorts of things. Travis told everyone a fantastical story while Liberty toaster marshmallows. 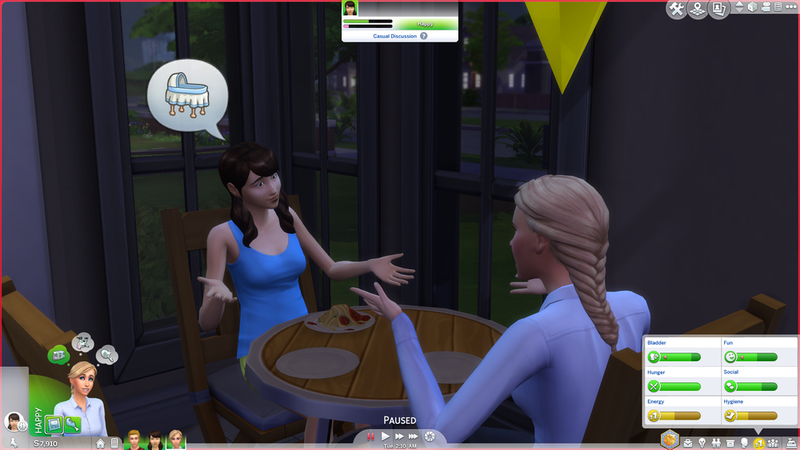 But they were interrupted by another camper...he recognized Summer from the club she went to a few nights ago. He is the bartender there. Being perpetually cheerful, Summer engaged him and conversation and Liberty decided to turn in for the evening. 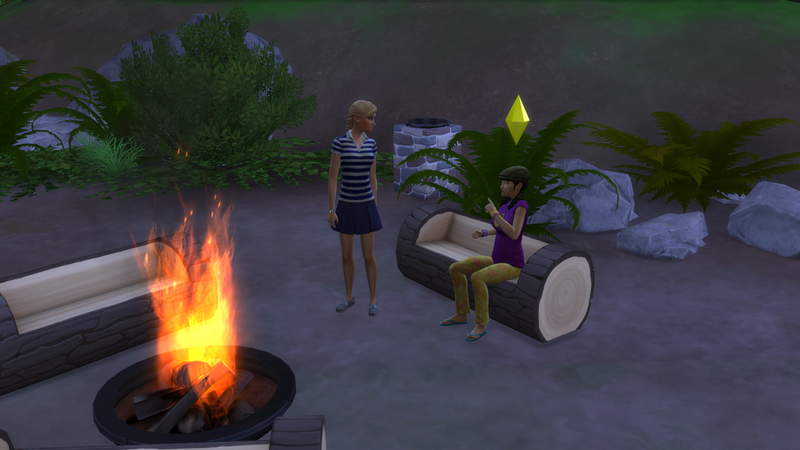 The following day, Summer and Travis stayed around the campsite while Liberty went for a long hike in the forest. Liberty is very interested in the natural world and she was going out hunting for new insect and plant specimens to add to her collections. Liberty asked if they wanted to come along and help, but Summer and Travis wanted nothing to do with it. During her travels, Liberty met a woman named Julie Adams who was fishing in lake along Liberty's path. Another campfire, and more conversations. Travis and Liberty discussed a new geeky show they were both into, while Summer listened in. On their final day of camping, Travis never wanted to see franks and beans again, so he made veggie burgers. Summer's burger appears to be untouched. Leftover franks and beans? During one of their last hangout sessions before they left, Summer sat very close to Liberty and did the classic "stretch and place your arm around someone" move. It wasn't very subtle, but Liberty was uncertain. After all, Summer was a kind, cheerful and affectionate friend. It was probably nothing...right? Travis and Liberty destressed on the couch before heading off to work. Travis played games on his tablet, while Liberty read a book, of course. 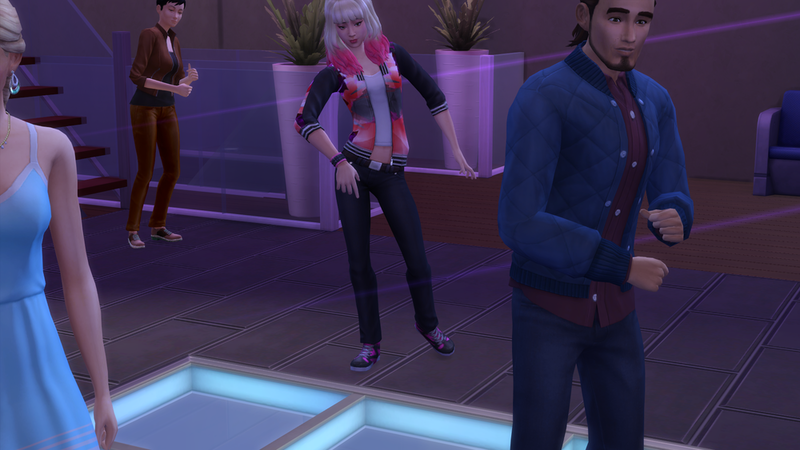 Summer had a couple nights during the week free, so she went out dancing. She met some friendly and interesting people. Summer watched and listened to a great DJ, watched some folks dance, and chatted with some members of the Spinmasters club. Summer isn't into partying that much, but she likes dancing and hanging out with interesting people. Summer has been continuing to go to the gym in her spare time- as much for the socialization aspect as the fitness. She's met Dina and Nina (pictured) Caliente, Don Lothario (pictured in the back), Brent and Brant Hecking, and Rachael (last name?, also pictured), the gym trainer. During this round of play, we had some great news- both Travis and Liberty got promotions! You would think they'd look more thrilled about it. Travis seems exhausted in his new...uniform? Summer brings out Libery's more playful side. Liberty enjoys making Summer laugh with silly jokes and funny faces. Also, it seems as though Liberty has developed a bit of a crush on Summer. Not that she intends to share that information with anyone anytime soon. The group decided to go on a camping trip to celebrate their promotions! They each took a couple days of vacation time, stocked up on some equipment, and headed out to Granite Falls. As it turns out, the only thing Summer wants to cook while camping is Franks and Beans. Breakfast, lunch or dinner- if Summer is cooking, that's what you get. 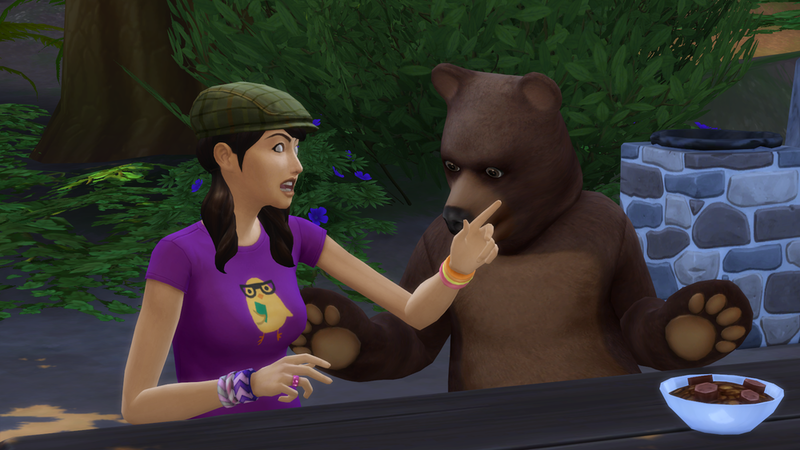 Liberty got so upset when someone in a bear costume sat down to chat with them. She wasn't having it. And then yelled at the bear. Seriously. She was not having this bear thing. She thinks it is weird and creepy. It was strange to see such an outburst from the normally quiet Liberty, but we all have those things that get under our skin. And that concludes Part 2 of Summer, Liberty and Travis's Round 1. More posts are expected this week! 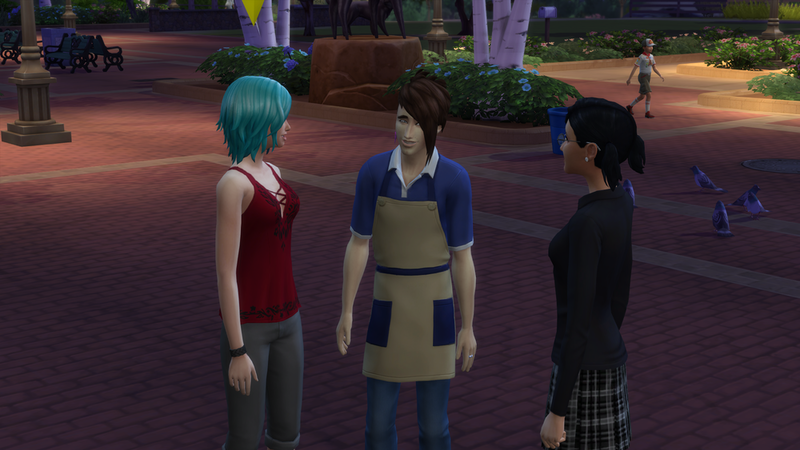 Liberty (left), Summer (middle) and Travis (right) have just become roommates in quite a nice home in Willow Creek. 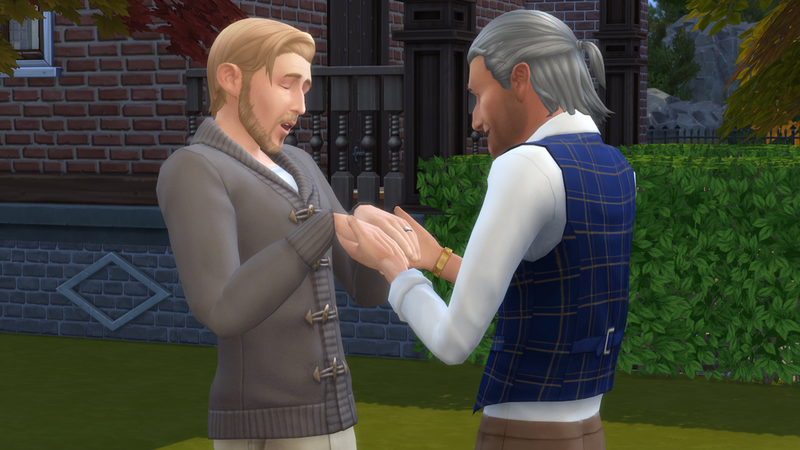 After they had moved in, and unpacked, they began to go about their new lives in Willow Creek. You could learn a lot about them from what they did next. Travis spent his day in his room on his computer. He was brushing up his programming skills before starting his new job in the tech industry the following day. He also chatted with people online in forums and such. He did all of this while listening to talk radio. 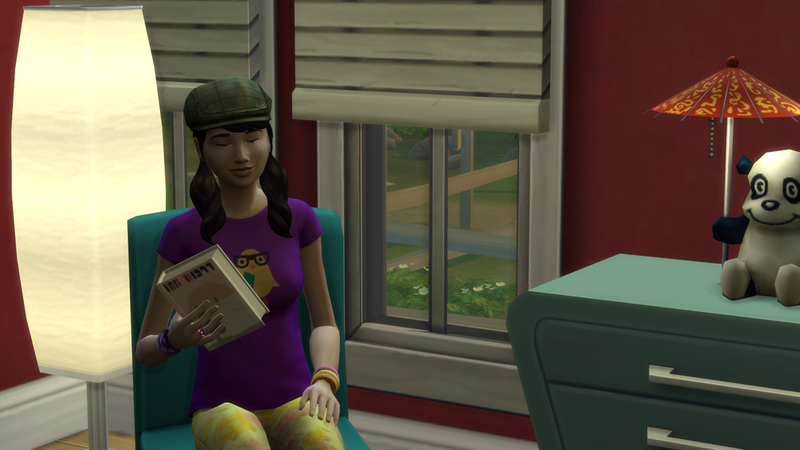 Liberty chose to spend her day off, before starting her job as an intern at the local space center in the quiet, stillness of her room, reading. Summer also went to the gym later in the day to run, and to meet more people of course. Despite Liberty's shyness, Summer was determined to make fast friends with her new roommates. Liberty didn't seem to mind. Introverts need friends too! Summer had a much better luck with Travis. While he likes his computer, Travis is about as outgoing as Summer. Summer works the evening shift, so she spent her afternoon doing a workout in the living room. Their living is very spacious, perfect for a power workout! Travis and Liberty have begun bonding over breakfast every morning. On the particular morning shown above, they were both eating leftovers that Summer had made. Summer has become the default cook of the house. Travis had left over garden salad, and Liberty had leftover brownies. Hmm...we need to get Summer to make more breakfast-type foods to leave in the fridge for them! And that wraps up part #1 of Round 1 in the home of Liberty, Summer and Travis. I'm already working on two more posts about them which will be going up sometime this week. I will also include a post that tells you what "Round 1" means, hehe! Thanks for reading. As always, comments are so loved and appreciated.